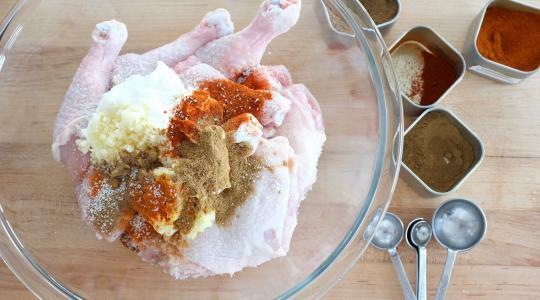 Pat the chicken dry with paper towels and put into a large bowl. Add the yogurt, oil, garlic, ginger, paprika, cumin, coriander, salt, and cayenne. Stir until well combined. Cover tightly with plastic wrap and let marinate in the refrigerator for at least 30 minutes and up to 12 hours. The longer the better. Heat the oven (with the oven rack in the middle) to 450°F. 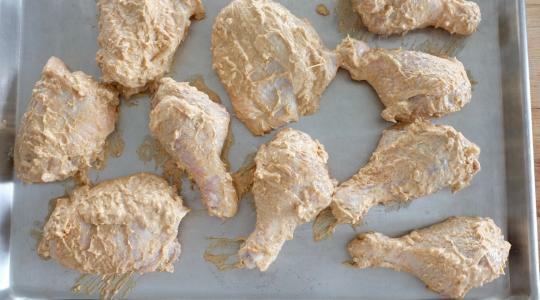 Put the chicken on a rimmed sheet pan in a single layer. Roast until charred and cooked through, 35 to 45 minutes. 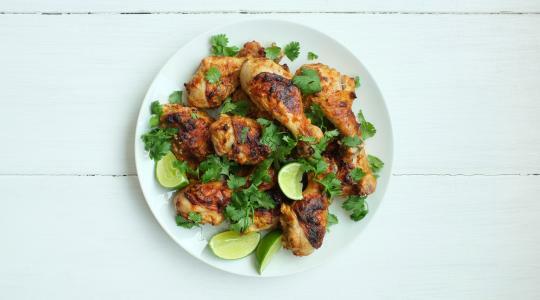 Serve the chicken topped with cilantro and a squeeze of lime.